﻿ What is The Polar Vortex and How Do I Prepare My Home For It? Over the last few years, the term “Polar Vortex” has become one of the most popular buzzwords used when referring to the frigidly cold temperatures we experience during the winter months in many regions of the United States. But what most people don’t know is that the polar vortex isn’t a new phenomenon; it’s something that exists year-round, and which only occasionally impacts the severity of North America’s winter weather. The polar vortex is an area of low pressure and circulating cold air that exists year-round at the Earth’s poles. During winter months in the Northern Hemisphere, the vortex in the North Pole can expand and send that cold air down the jet stream, all the way to our front doors here in the U.S. Although the polar vortex is too high in the atmosphere to be associated with any kind of large-snowfall-producing storm system, it can sometimes be the source of the bitter cold we feel coming from the Arctic regions. So, other than making the walk to our mailboxes unbearable, how does this cold air affect us and our homes? Well, subzero temperatures can cause problems such as ice dams and frozen pipes that, if not attended to, can cause some serious damage to your home. 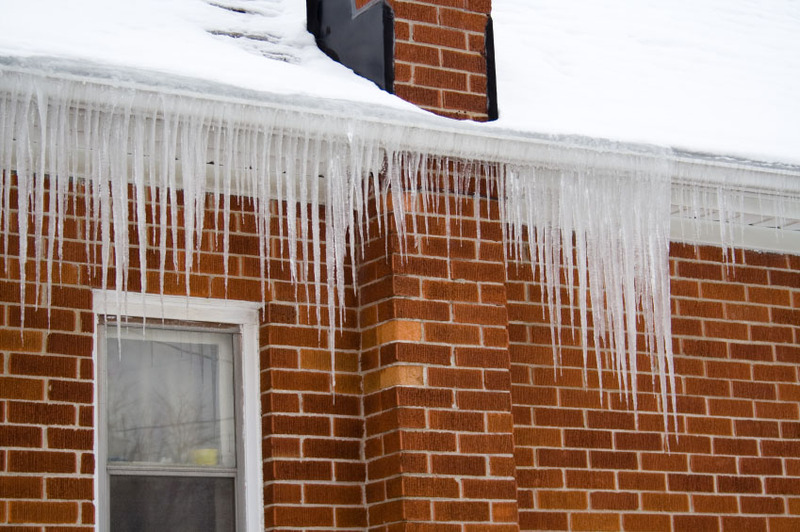 Ice dams are ridges of ice that form on the edge of your roof and prevent melting snow from draining off your house. These dams often result in the melted snow leaking into the house, causing water damage to your home’s interior. Some things you can do to prevent ice dams from forming are: removing the snow off your roof (for example, with a roof rake) and/or increasing the insulation in your ceiling or attic. For more detailed information about ice dams and how to prevent them, visit our blog post here. Properly insulate all your accessible pipes with pipe insulation. Before the winter months, seal all cracks, holes, and other openings on exterior walls to prevent cold air from getting in. Disconnect all your hoses and install insulating covers over the host bibs. When cold air is predicted, let all your faucets drip to prevent the water from freezing inside. If freezing does occur, this will prevent pressure build up as well. Install a water leak protection system in your home to alert you when a leak is detected. These can be found at a plumbing supply store. Before leaving your home unoccupied for an extended period of time, shut off your water supply and drain your water system. Install a smart thermostat that allows you to monitor the internal temperature of your home remotely. Hire a service to install heat sensors and provide monitoring service that will alert you if the temperature drops below the desired level. Have a friend, neighbor, or family member check on your home while you are away. For more information on the dangers of freezing water and boilers, click here. By taking steps to prevent and treat ice dams and freezing pipes, you’ll ultimately help prevent the more inconvenient and expensive problems that a polar vortex brings. For more tips and resources on dealing with winter, visit our “Winter Safety” blog area here.